DJANET, ALGERIA — Last night we had a late night of music under the stars, just savoring the moment. Of course for the guys it is different. They live here and can come back out to the desert any time they want to. I leave the Sahara tomorrow and it will be a long time before I can come back. This trip has been really special and even though we had stayed up late, I woke up very early and went for a walk by myself to explore the landscape of stone spires with sand dunes in between. I went climbing up onto the rocks and into the crevices connecting with the earth itself. Then I walked out into the middle of the sandy pass between the rocks and climbed up on a dune, and hiked around to the rockspill on the other side. Meanwhile the sun came up and started to change the color of the rocks and the sand, and I realized the dust had stopped blowing, so probably my flight would be fine. As I scrambled about the rocks, I went to take a photo and did something weird with the camera and realized it had a “selfie” mode, so I took a few “selfies” in the desert morning before walking all the way around the rock pillars that we had camped between and back to camp. The guys had pretty much packed up the truck by the time I got back, and we headed out for a last day in the tenere. We drove through the rock forest between the spires and rock formations. Eroded “fins” in the distance seemed to be like some kind of “Maze”-type landscape. And we got plenty of camel time. 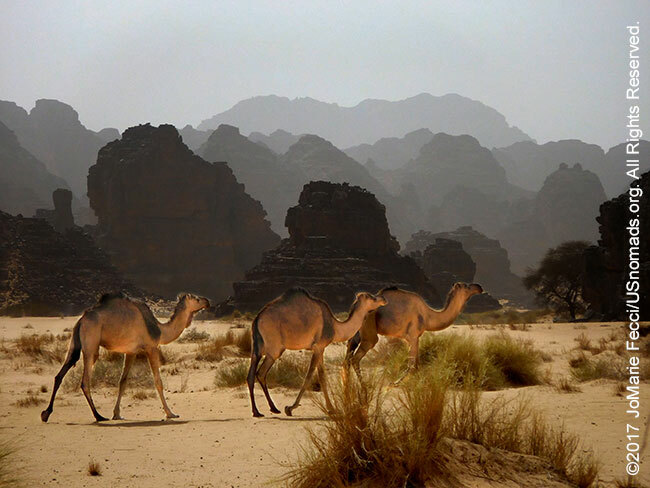 I was really seeing the difference that Mohammed had explained to me between “wild” camels and “people’s” camels. The “wild” ones did run away when we try to approach and I cannot get very close to them even on foot, but the ones that are “owned” are comfortable with people and will let you walk almost right up to them. Apparently it is because they are used to people and trucks and know that humans bring them food and water. Although some of them are “hobbled” with a rope loosely tied around two of their feet so they cannot run. They can still walk around freely, but they will not be able to run off at a fast pace. Only some of them are tied, so I guess they are the ones who tend to run off, while the others must be more easy going. Some of the camels had baby camels (or at least smaller young camels) with them, and they were very cute. We were able to get a lot of fun camel shots. We also stopped to make a group photo of the team all together in the desert. We past a cave where they say it is haunted and that they had found many years ago a young child who’s mother had died, living in this cave, and since then people can hear sometimes a child crying in the cave. We didn’t hear anything unusual or see anything of the haunting. Later we also passed some rocky spot where there was a marmot or two. I didn’t see them at first. The guys saw them. Mohammed explained to me that to see things in the desert well you need to always be looking far in the distance and scanning. I know that I have gotten a lot better at spotting wildlife and details in the landscape already since I started spending time out west, and during this trip I really sharpened my skills at interpreting tracks, too. This morning I had been following camel tracks in the sand, and Mohammed said that the nomad camel herders could tell which tracks belonged to which of their camels. I guess it is like how we can sometimes know which tire tracks are from which vehicle (though that is usually due to a tread pattern, which camel’s feet don’t have!). At one point we passed a dead camel skeleton in the middle of nowhere. A symbol of something. I had not seen a lot of evidence of animal depredation here at all, so it was surprising, and the only one I had seen in the whole journey. We stretched out the day taking the desert pistes as far as we could before coming back to the tar road just outside Djanet.